I want to present the quests that we use, "as played" in our Play by Post game. They will also contain a comment about the real life experience we made with this quest. We changed the number of players participating during the campaign, so the quests shall not be understood as "the wisdom for balancing" or anything - it's just what we used. Four mercenaries offer their help to the Barbarian; one of each kind. Place them next to the Barbarian, right before she opens the iron quest entry door. A: If the Barbarian searches for treasure in this room, 75 Gold Coins are found in the chest. B: The evil Crossbowman does not move but fires his crossbow at the Barbarian once during each of Zargon's turns until the Barbarian reaches him. If the Barbarian moves next to the Crossbowman and attacks, the Crossbowman surrenders immediately, offering his crossbow in exchange for his life. The Crossbowman then runs away. The Barbarian should take the equipment card. C: If the Barbarian searches for treasure in the room, a shield is found in the tomb. Take the matching equipment card. D: If the Barbarian searches for treasure in this room, a longsword is found in the weapons rack. Take the matching equipment card. In total, the mercenaries and the Barbarian together lost 14 Body Points; and that's with the additional attacks that come from the mercenaries. How a single Barbarian is supposed to survive, I don't know. 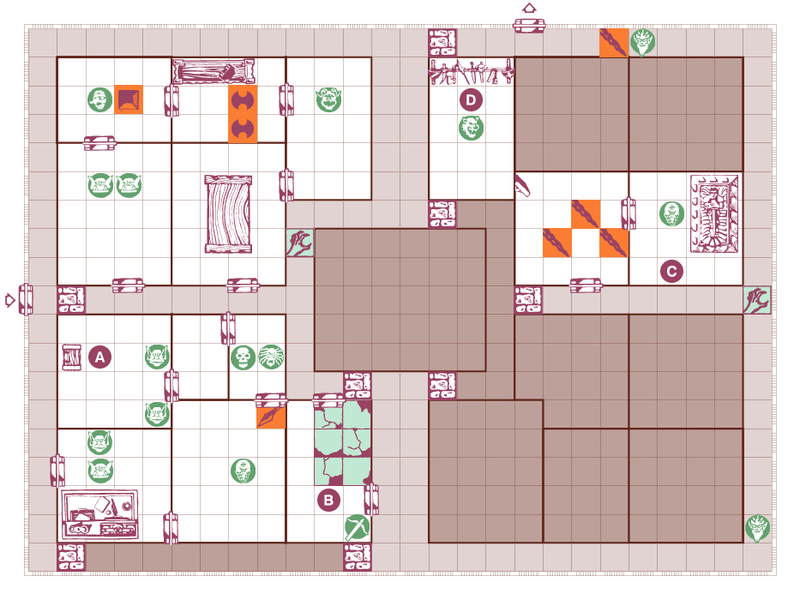 During the game, clmckay and kitch discussed that the northeast sector likely doesn't contain the exit as it is surrounded by a hallway; so that part is avoidable damage. Maybe that's the solution, just don't go everywhere. On the other hand, if you take the minimum path, you won't have enough gold to buy mercenaries and survive part II. Quest 2 - A Quest for three beginner heroes and four mercenaries. Xanon Pass leads to an underground outpost on the slopes of the Cyberian Range. This outpost is a base of operations for minions of the Frozen Horror.It threatens several nearby villages. You must enter the outpost and slay one of the Frozen Horrors lieutenants, a Chaos Warrior named Krag. The only way in or out is through the Ice Cave entrance. Your Quest begins and ends there." This quest is adapted for a beginners Dwarf and Wizard; a Barbarian that played the first quest and four mercenaries. D:If a hero searches for treasure in this room, 120 Gold Coins are found in the chest. This quest was WAY to close for my taste. All mercenaries died, and the hereos had four body points left among them. I added some of the small monsters to accommodate Dwarf and Wizard in the quest - However I underestimated just how much damage those two wandering goblins would deal. I normally calculate three wandering monsters per quest, our hero group found six or seven. Then our heroes had the wandering monsters in exceptionally bad circumstances, like, being completely alone, draw two treasure cards with a special item, get 1d6 gold and miss the next turn, plus a wandering monster. Woah! three attacks for free for the two goblins! Suddenly even Goblins get really really dangerous. Why "what I thought"? After the quest was over, I double checked and found out that in the original is a Yeti together with Krag in the boss room (top left sector, the third room). I did not have that one, an I don't know where and when I lost it. I did not remove it consciously. But I can tell you, if the Yeti had been there, the game would have ended with a total party kill.